Location: Saltdean,Nr Brighton,East Sussex,Hither Green,SE London. Absolutley biblical rainfall rates running SE of the capital. A good 10 minutes thundery rain that turned the streets into rivers. A chorus of emergency service sirens as soon as the rain stopped. Decent flashes and rumbles too. Sunny now and dry. Risk has moved East. Next chance up here on Sunday/Saturday night. What a storm that was this morning. Been too much cloud so far here, blocking the sun from getting to work. Hopefully now this residual muck clears, the mid afternoon will help to fire that stuff exiting wales later on. Looks good further south though, and the usual Lincolnshire storm magnet getting going. 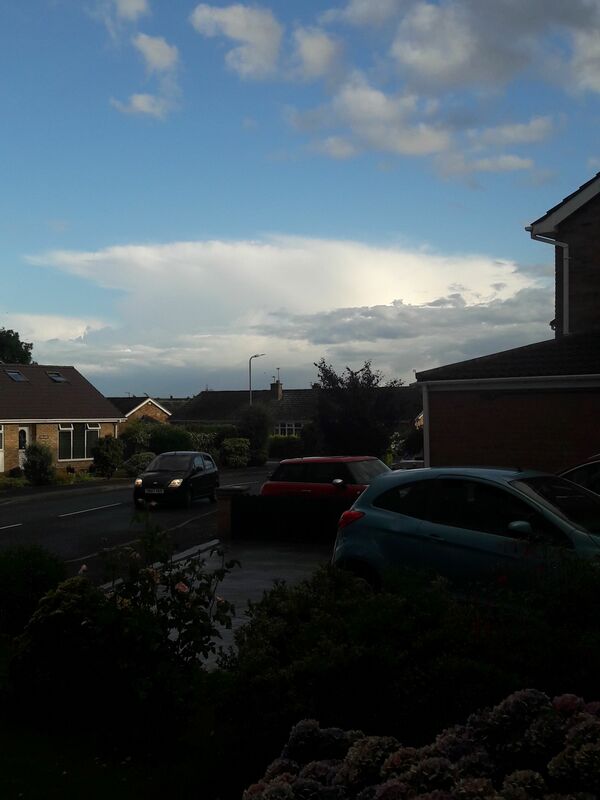 Well that was typical.get a shower and as it moved away it became electrified still booming away to the east off rugby probabout 20 odd miles away now.some nice cc and cg but in frequent. Pano of the line of storms that moved through London area earlier looking north and west from local park view point before they came through. Think the worst of it will hit Huntingdon onto Cambridge. Direct westerlies usually result in showers breaking up over rockingham forest area and the main events following the A14 corridor. Seen it hundreds of times. We do better from SW’erlies or slightly North of West. happy to report I can hear thunder. So last night I was in Cowden (south of Sevenoaks). As the sun was setting the western sky turned absolutely black and started lighting up with orange IC lightning and thunder. This continued for well over an hour (I have some pics of the storm approaching which I'll try and upload when I get a minute). Later that night, after 1pm I was doing a bit of stargazing as the annual persid meteor shower gets going this weekend and not only saw two shooting stars (one was pure white, the other bright orange complete with tail), but there was constant distant lightning flashes to my south coming from two cells, one in brighton and another in eastbourne according to radar. Half an hour later the brighton one had died but the eastbourne one took over. I could see the anvil even from that far away (about 60 miles) and could see the whole thing lighting up. The anvil was absolutely huge and was more of a mushroom cloud shape than a traditional/typical anvil. Too far away to hear any thunder, but the light show was spectacular - I could even still see it when I got home (another 30 miles further away ) at 2.30am. Must've been one hell of a storm. We also got a storm this afternoon at 2.30pm. It didn't come right over but brushed past to my west heading north. Had a few flashes and some nice rumbles, torrential rain too which lasted about 25 mins. It's been a good 24 hours! It is the most rain, wind and the loudest thunder Thurrock has for several months. The rain started early and has kept raining with hardly any interruptions. It has really been a memorable day. Awesome looking clouds over London way. Oddly according to radar should have very heavy rain right now, but hasn't rained for about 45minutes now. 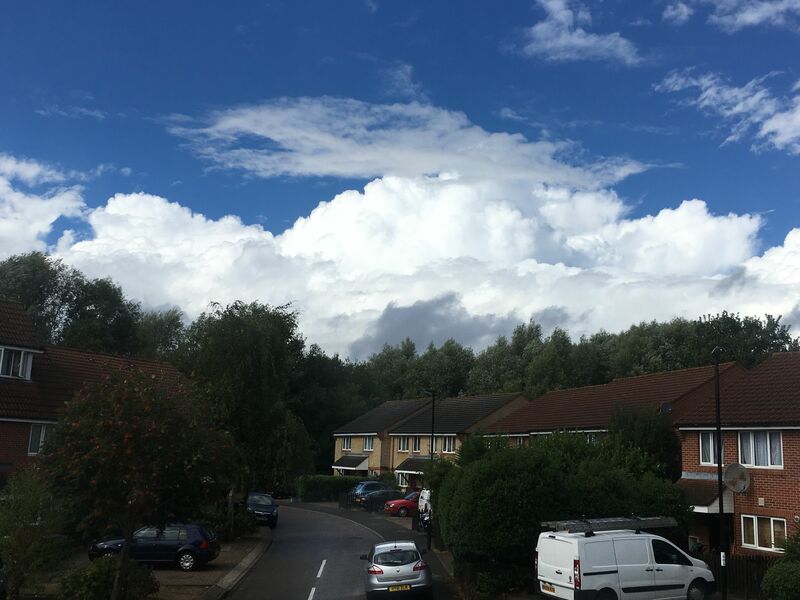 Can confirm, MASSIVE cell to my northwest (complete with HUGE cauliflowers and rapidly developing anvil) slowly drifting eastwards. Not showing on radar so no precip coming from it yet but I'd expect it to go bang imminently. This funnel-cloud appeared down the road from here, didn't see anything though other than noticing the heavy-rain shower. I knew before even clicking on that link that I'd see the dreaded "Mini tornado" as the uk media continues to deny TORNADOS exist in this country. "Mini" tornado my backside. And I can see something huge to my Northeast. 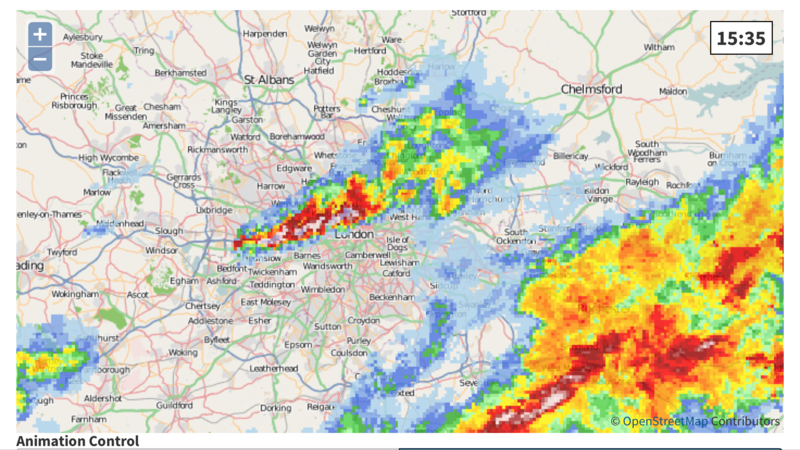 Looks like the Thames area is going to get hammered. Edit - Just had a look outside. That huge cell is now directly to my north so it's gonna track parallel to me but won't come over. Looks like it's heading directly east so on it's way to you Lauren, but I think you will miss out on it coming directly over too and like me you will see it track parallel to the north of your position from west to east. Some more dark looking cells to my northwest slowly tracking east. Sky looks incredibly unstable, it's a great day for sky watching! Thought I saw a brief funnel coming from the nearest cell but difficult to be sure at this range. I'm gonna put it down to cheeky scud! good afternoon ladies and gents. well the gardens well and truly got a soaking here in stockton. very heavy rain, even some hail (around garden pea size) and a few decent cracks of thunder, never seen no lightning. Just enormous Cu outside. I can't get a picture that does it justice. I rarely see them this enourmous in the UK.